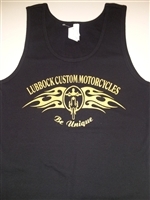 Lubbock Custom Motorcycles Original Logo on a Woman's Tank Top in Gold Glitter Lettering. Don't forget! Once you get your T-Shirt in, take a pic with it on by some land mark or place you are visiting and share it on our Facebook page. 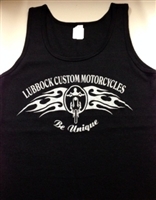 Lubbock Custom Motorcycles Original logo on a Women's Tank Top with Silver lettering. Don't forget! Once you get your T-Shirt in, take a pic with it on by some land mark or place you are visiting and share it on our Facebook page.